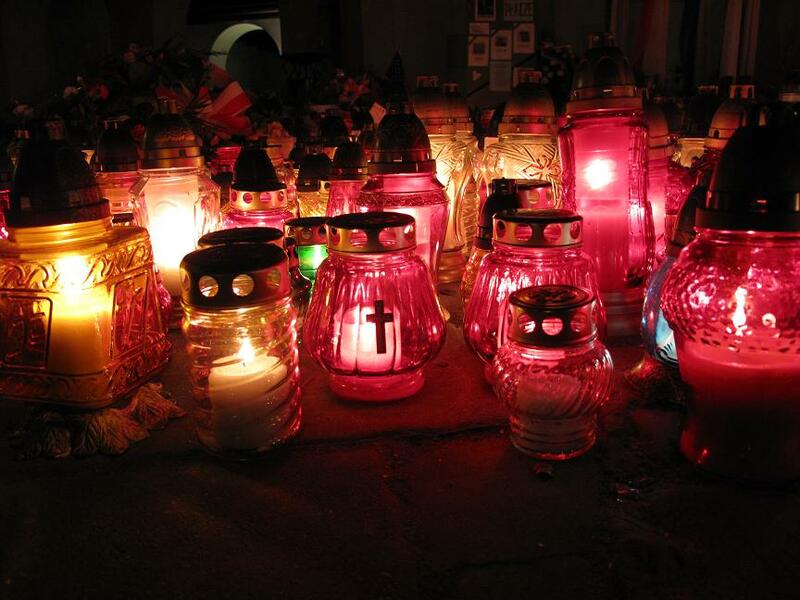 A week of mourning has officially come to a close in Poland. Unofficially, however, there are still many funerals to be attended, 20 additional bodies to be identified from the crash, and weeks–possibly months–to get this country back on its feet (mentally and politically). Saturday’s tragic plane crash and the deaths that came with it left the nation paralyzed. 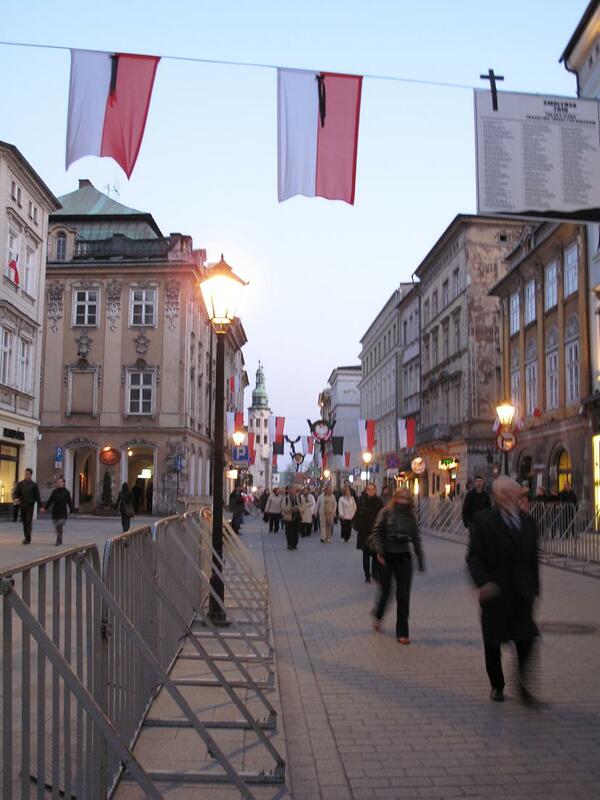 Stores and schools closed down on Monday following the tragedy, cultural events were canceled, and a week of national mourning was declared by Prime Minister Donald Tusk. 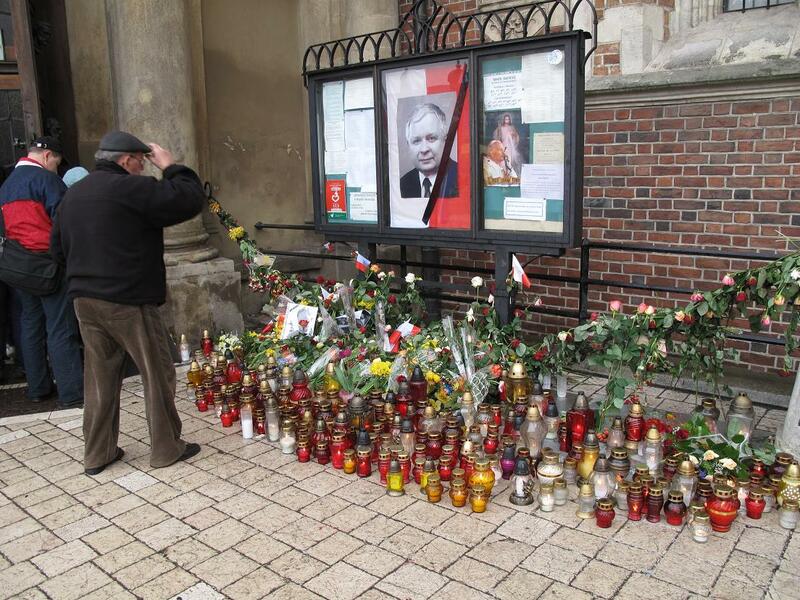 Round-the-clock news coverage showed images from the crash site in Smoleńsk and the arrival of coffins in Warsaw. 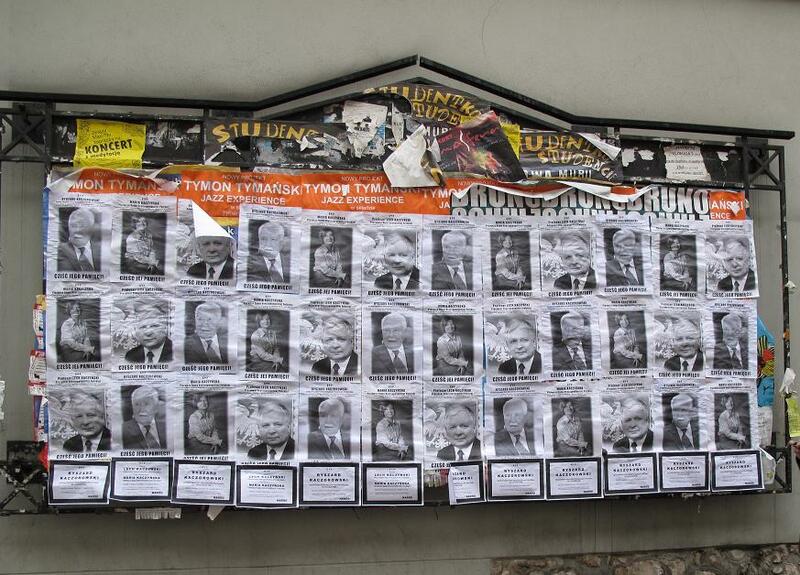 A necrology of the victims flooded television screens in trams and plastered bulletin boards on the streets. The scope of the tragedy was burned into the nation’s consciousness. 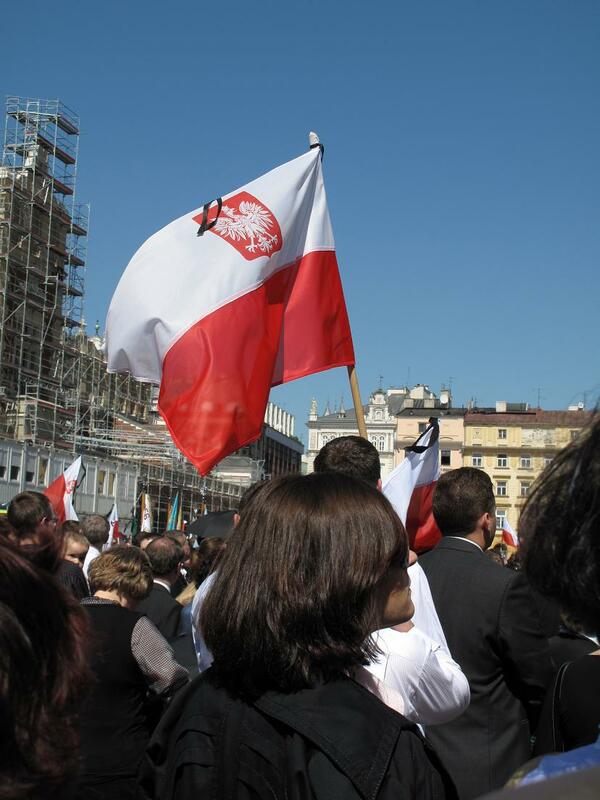 This predominantly Roman Catholic nation expressed its mourning by attending memorial services and laying candles and flowers at the foot of monuments commemorating Katyń. 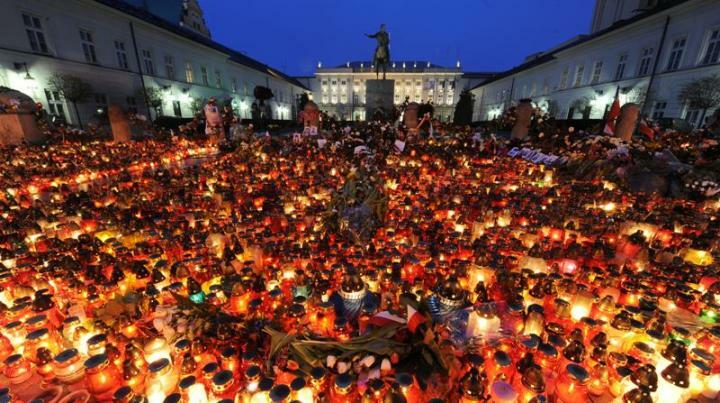 Varsovians gathered in front of the Presidential Palace by the thousands, illuminating Krakowskie Przedmieście with their votive offerings. 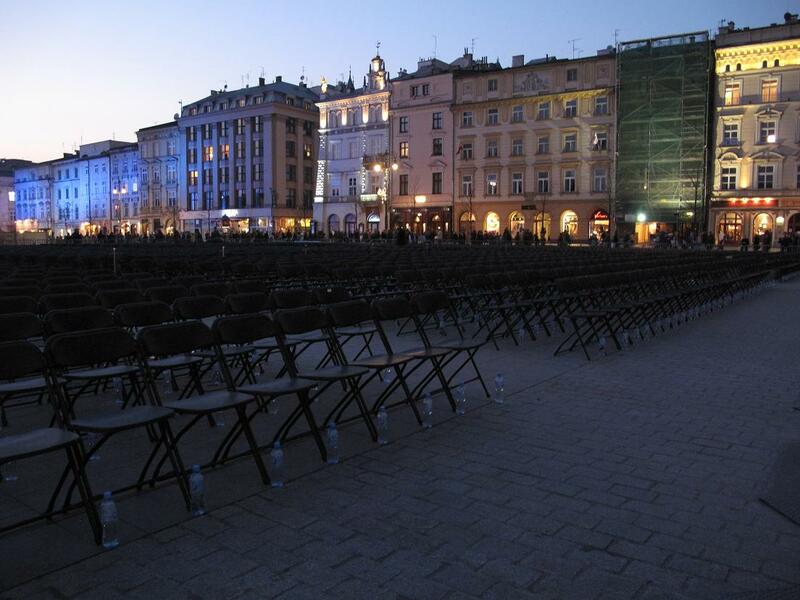 On Saturday, April 17th–a week after the fatal crash– a memorial service was held at Warsaw’s Piłsudski Square. 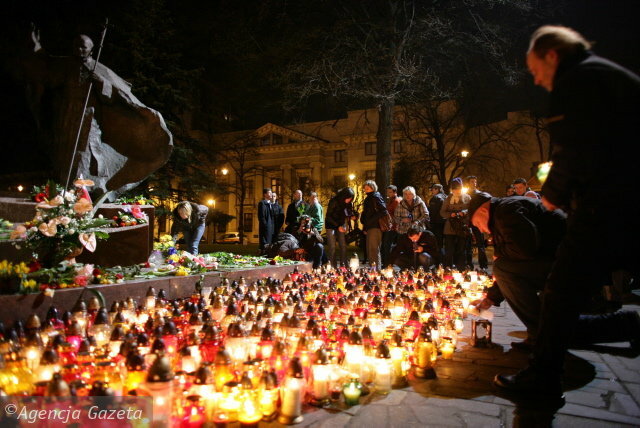 Approximately 100,000 people crowded the square and nearby areas to pay tribute to the 96 victims of the plane crash. 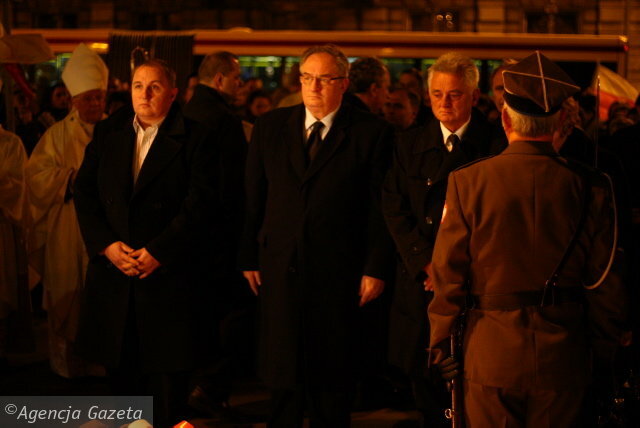 Kaczyński’s twin brother Jarosław, Lech and Maria Kaczyński’s daughter Marta, along with top officials of the Polish government, as well as foreign dignitaries (including U.S. Ambassador to Poland, Lee Feinstein) were also in attendance. These words would inspire an entire nation; in remembrance, a cross was erected on the spot where the altar once stood. 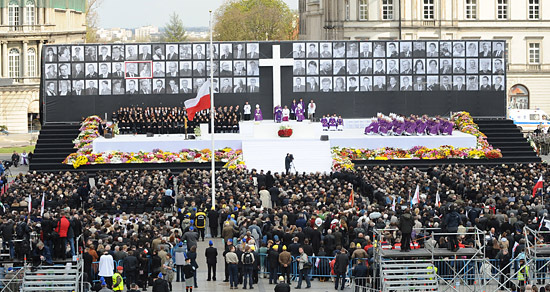 This cross now bore witness to another pivotal event in the history of Poland: the biggest tragedy in its postwar history. 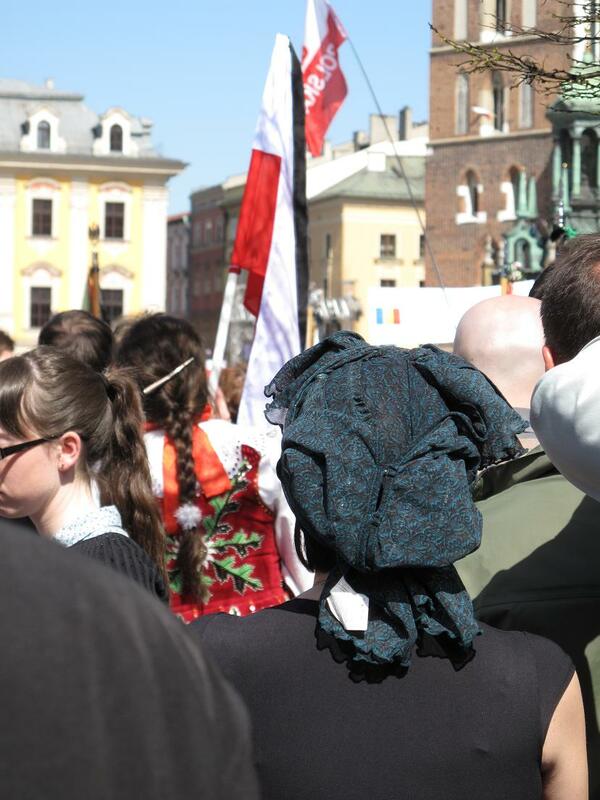 I made it a point to bare witness to another historical event: the funeral of Lech and Maria Kaczyński in Kraków. I arrived on Thursday evening and stayed with Senior Fulbright Lecturer, Lori Kent. 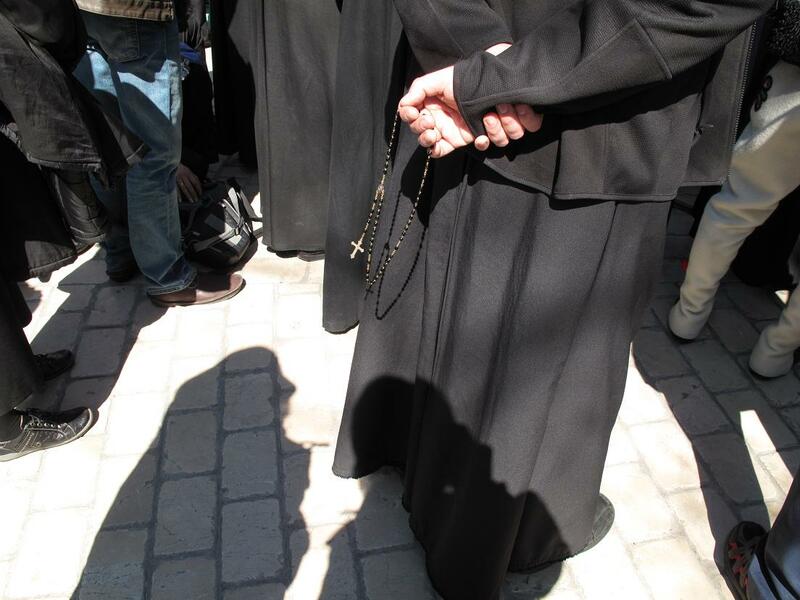 On Saturday morning, we got up early to wait in line for passes to the Main Square for Sunday’s funeral service. 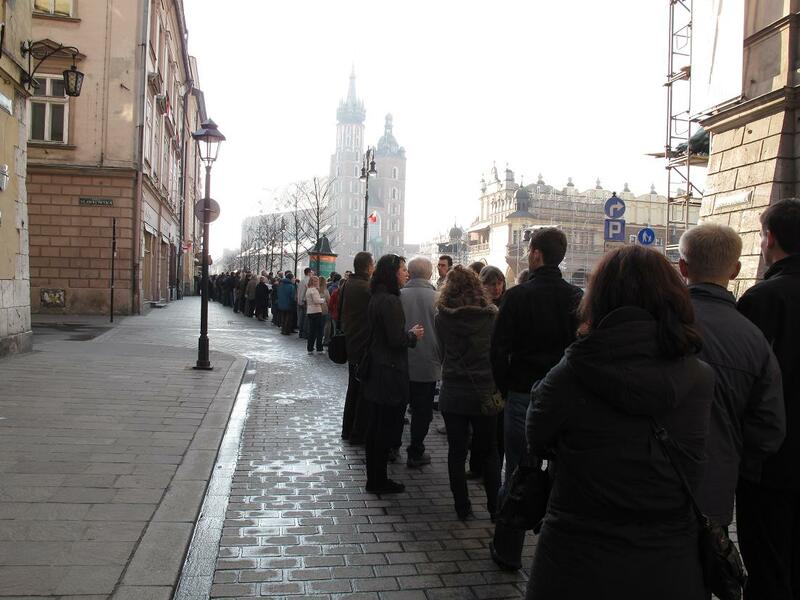 The line stretched around the corner of Św. Jana and down the north side of the square for about half a mile. We got there around 8am and waited about 2.5 hours to get our passes. 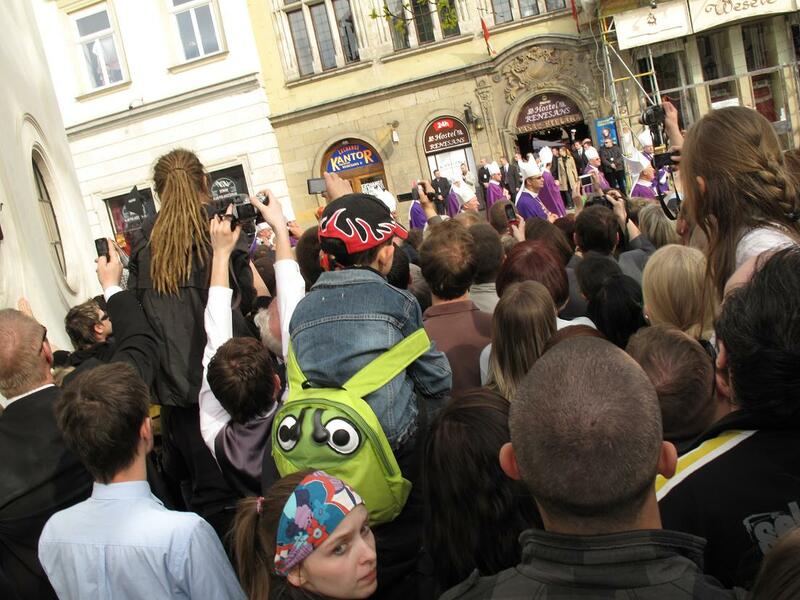 While waiting in line, we found out that Mozart’s Requiem Mass was playing at the Main Square that evening. I also snapped pictures of a memorial to the fallen President and the rest of the victims outside of St. Mary’s Basilica. 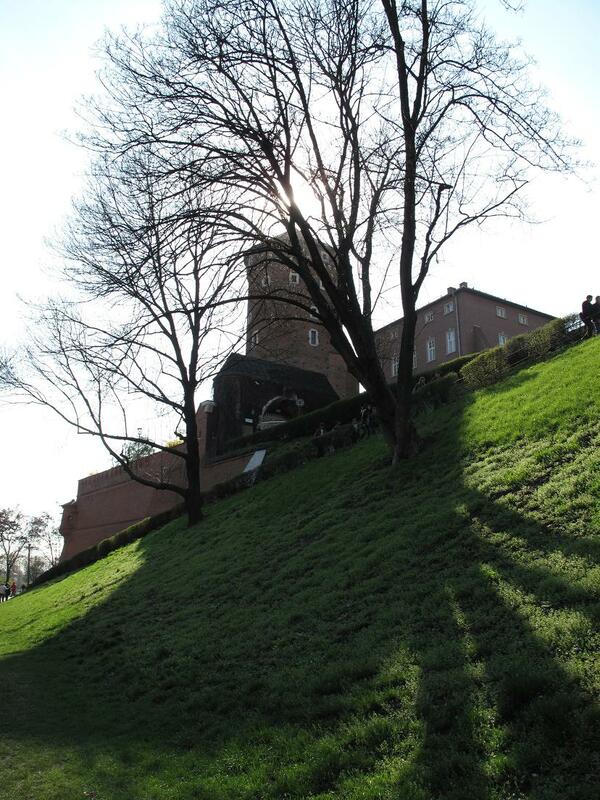 Next, we took a walk over to Wawel, Kraków’s breathtaking medieval castle. 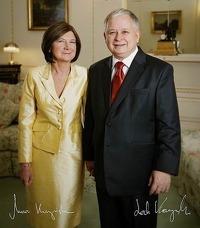 After the funeral mass at St. Mary’s Basilica in the main square, Lech and Maria Kaczyński were to be laid to rest in a crypt beneath the castle’s cathedral. 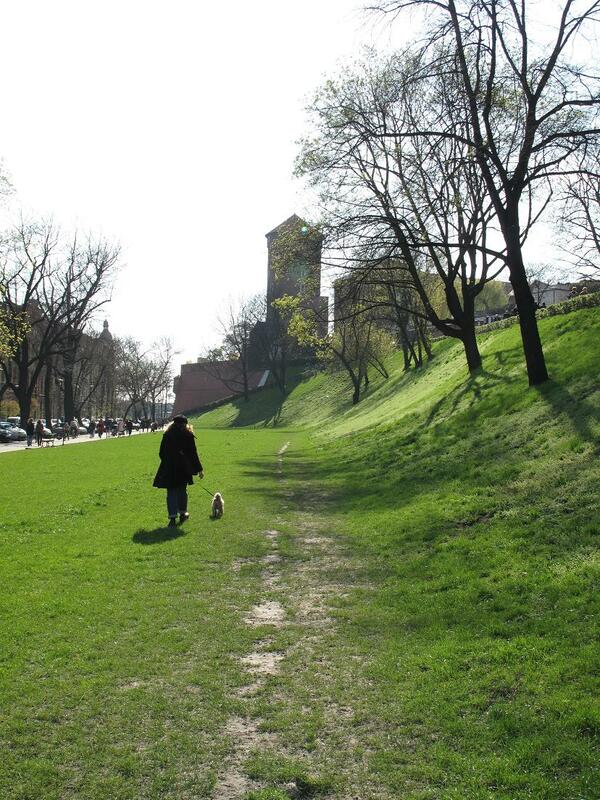 On our way back to the square, we walked over to the Błonia– a vast meadow (48 hectares–about 26 football fields) adjacent to Kraków’s old town. 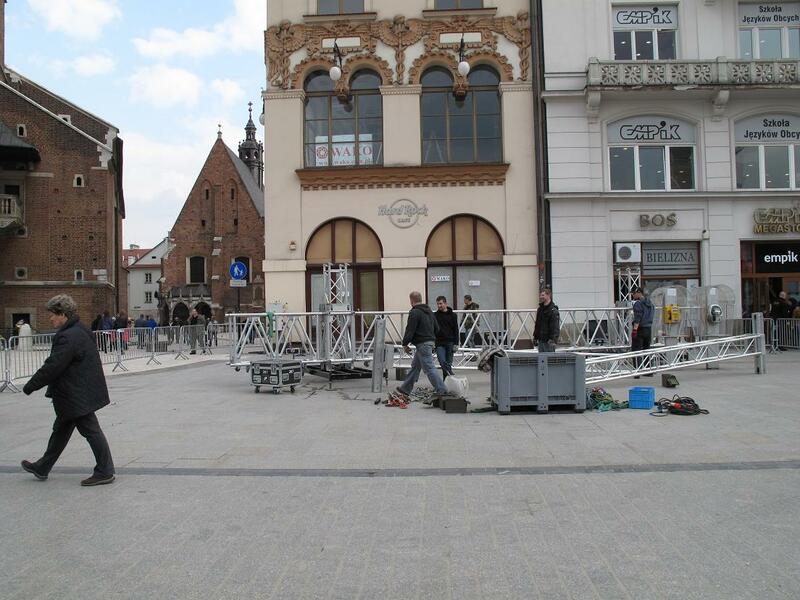 They were setting up a screen there, too, which would be relaying the funeral to the masses gathered there. 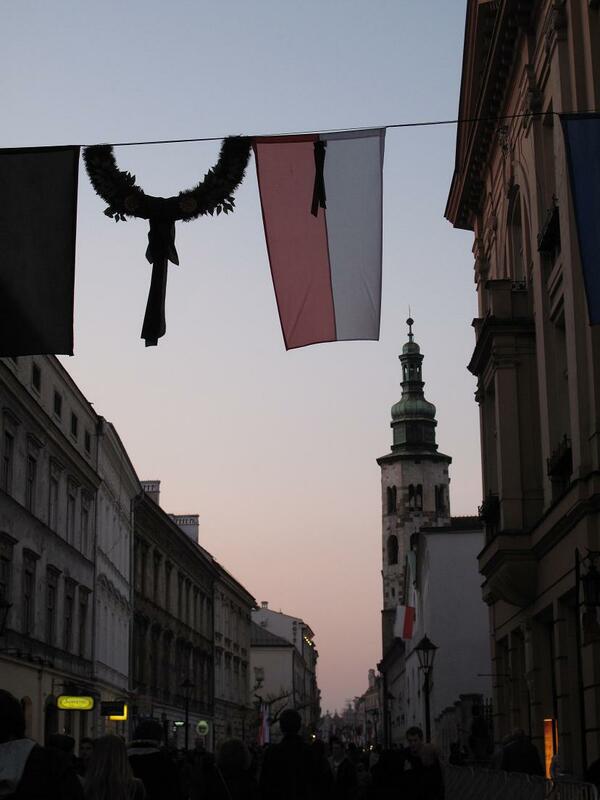 We headed up Grodzka Street, where they had already finished hanging banners and flags. 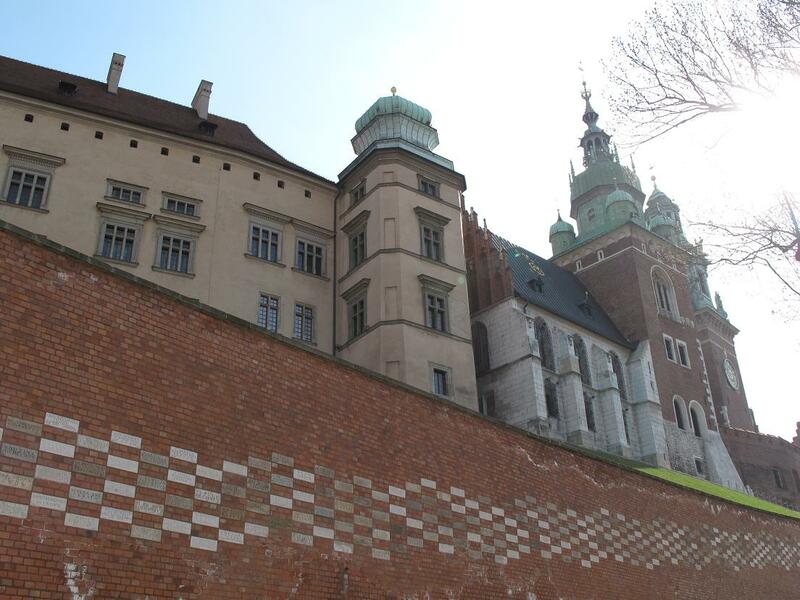 The funeral procession would be going down this street, and over to Wawel Castle. 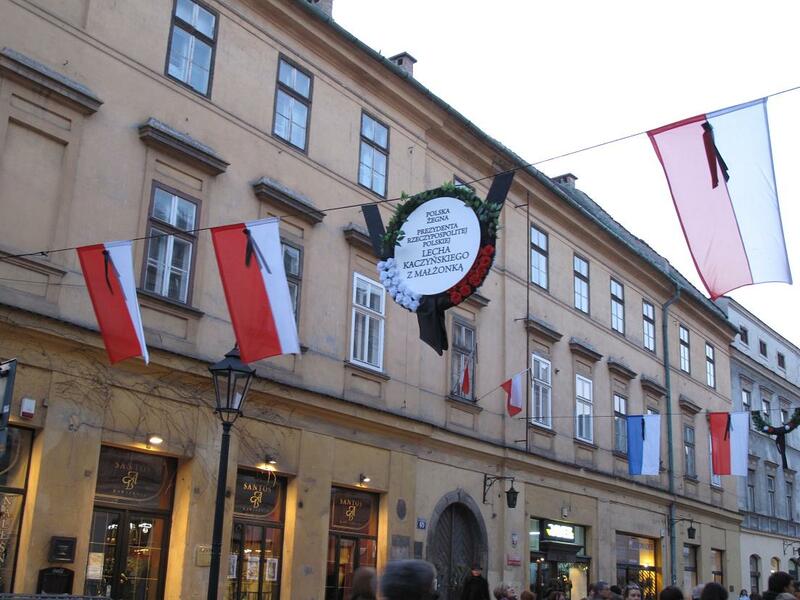 The banner reads: Poland bids farewell to the President of Poland, Lech Kaczyński and his wife. 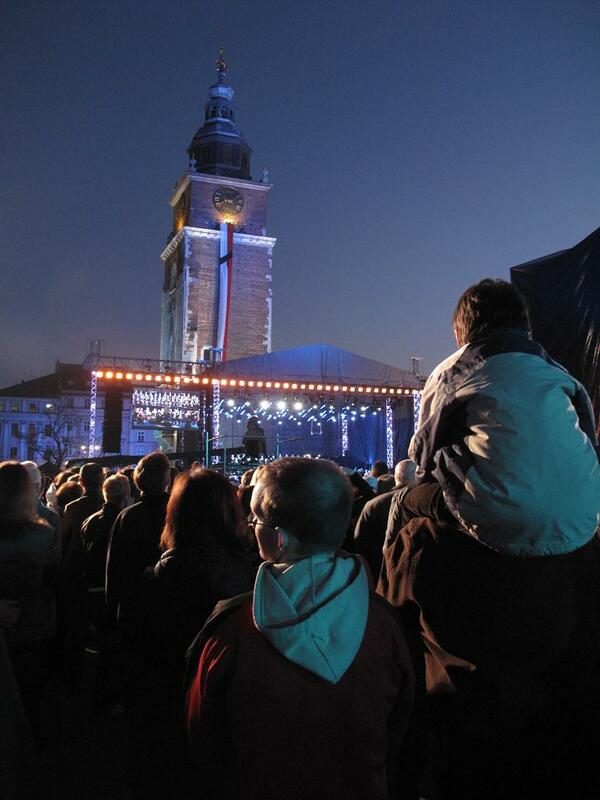 A special concert of Mozart’s Requiem in D Minor was held at 8pm in the Main Square. 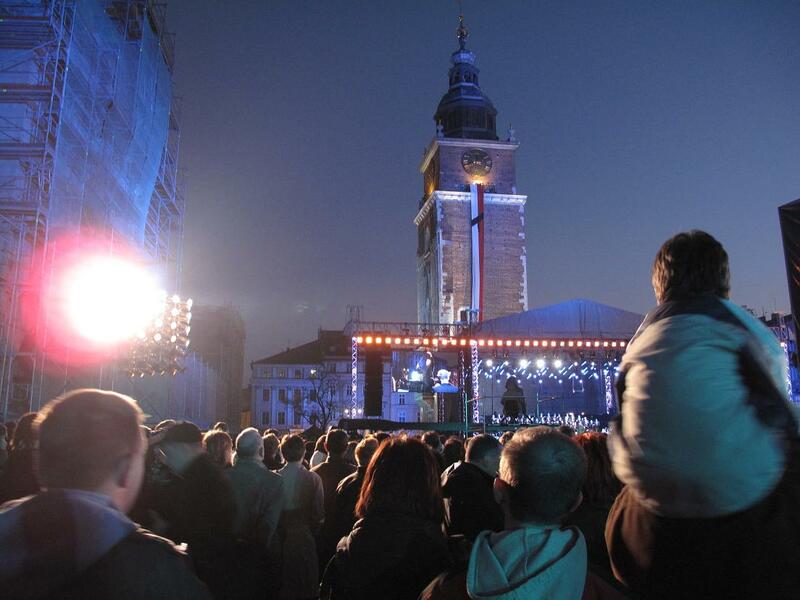 The work was performed by the soloists soprano Yulia Lezhneva, mezzosoprano Anna Lubańska, tenor Rafał Bartmiński and bass Wojciech Gierlach, the Sinfonietta Cracovia orchestra, vocal ensemble of Capella Cracoviensis and Polish Radio Choir under the baton of Marc Minkowski. 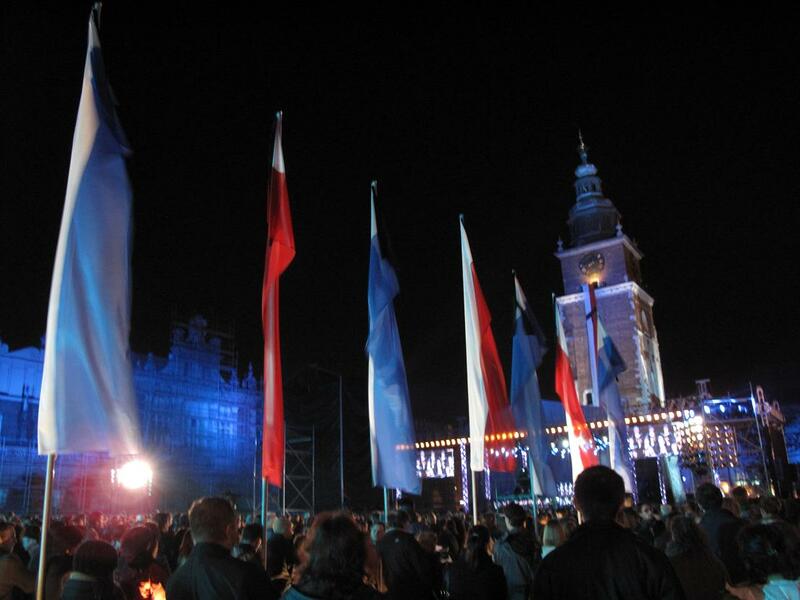 The evening vigil on Kraków’s Main Square was a tribute to the victims of the tragedy and to express solidarity with their families. 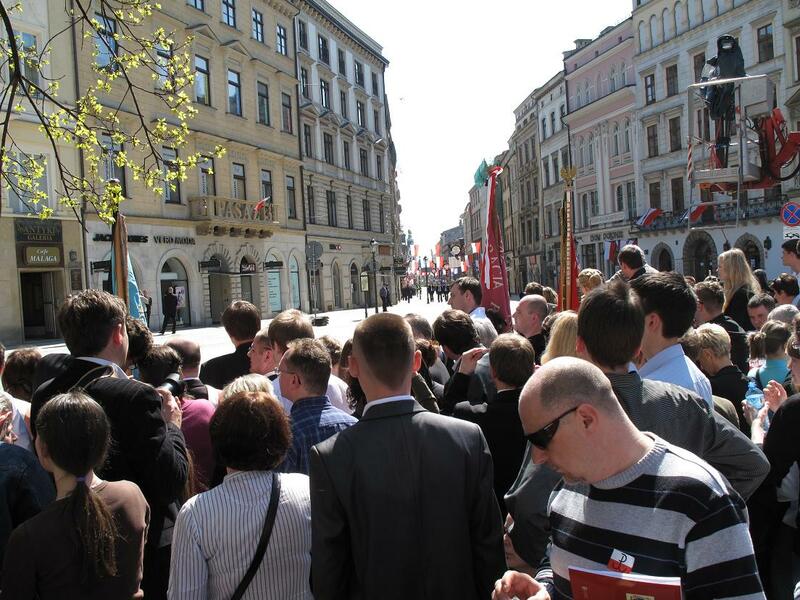 On Sunday morning, we headed over to Bracka Street, entrance point for those with passes to the Main Square. 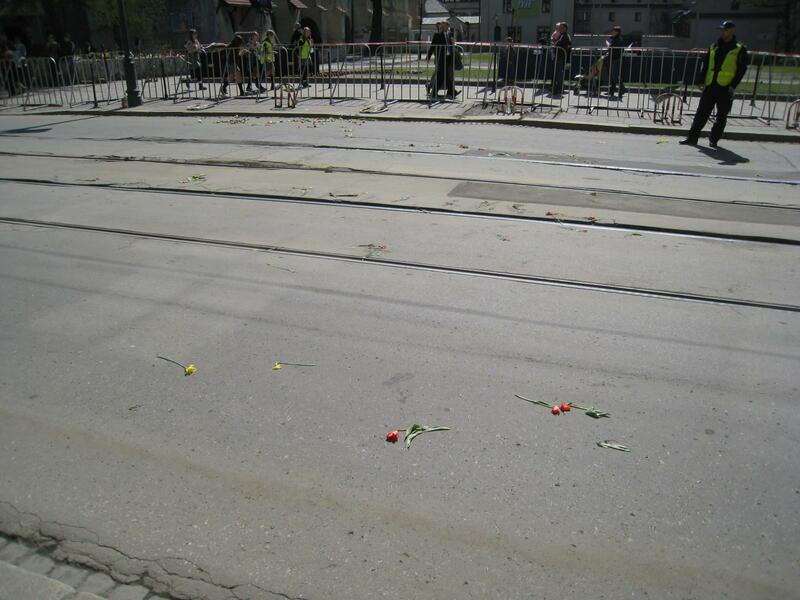 There were still flowers on the road from when the hearses drove by that morning, on their way to St. Mary’s Basilica. We waited about an hour to get in through the gates on Bracka Street. Each person had to go through a security check. 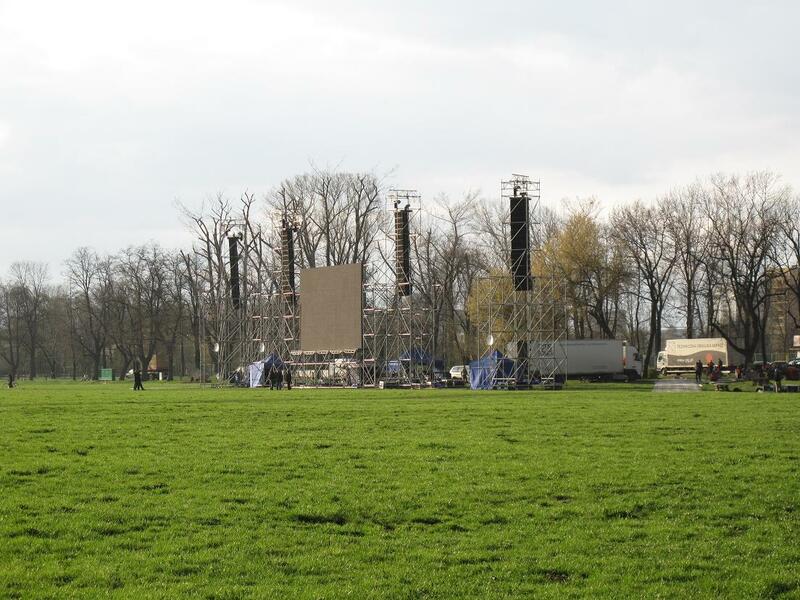 When we finally made it through the gates, the square was beginning to fill up. 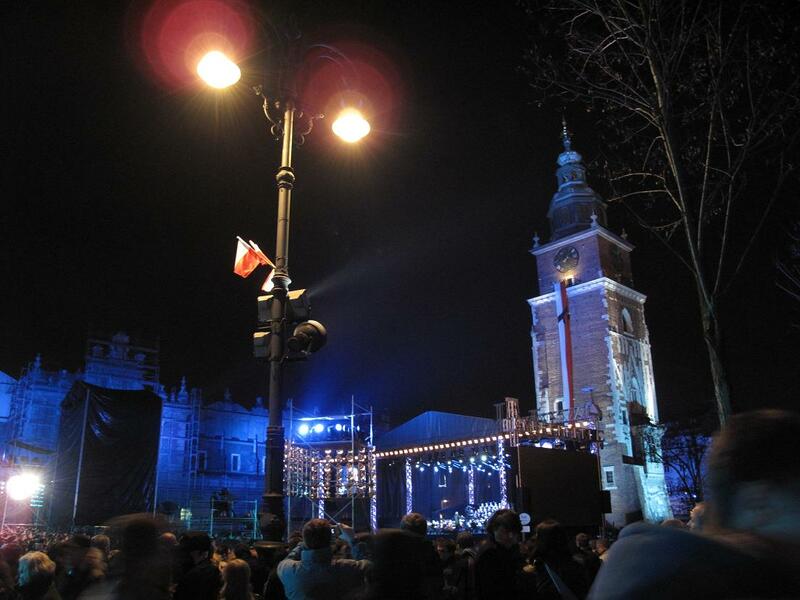 We ended up near St. Adalbert’s Church (at the Southeast side of the square), from where we could watch the telecasts of the mass going on inside the Basilica, as well as the procession as it came down Grodzka Street. as well as officials from Belarus, Armenia, Mongolia, and Iraq. 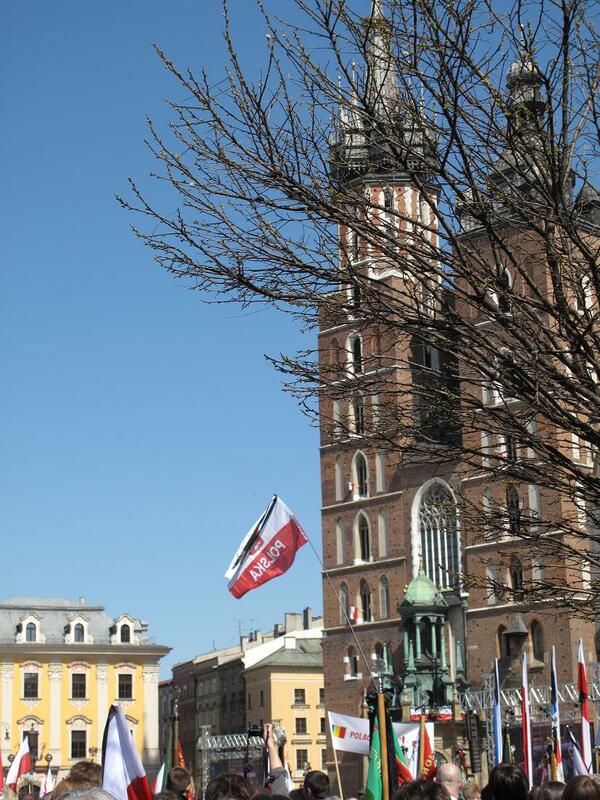 The funeral mass for Lech and Maria Kaczyński was held at St. Mary’s Basilica, Kraków’s beautiful Gothic church on the main square. Everyone raised their flags as they sung the hymn. 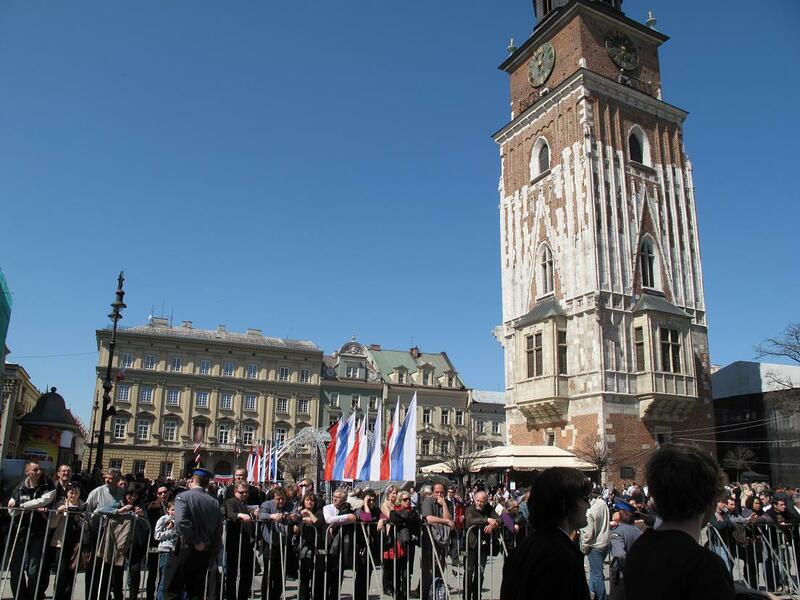 After the mass, the funeral procession went down Grodzka Street to Wawel Cathedral, during which the bell on Wawel hill rang. 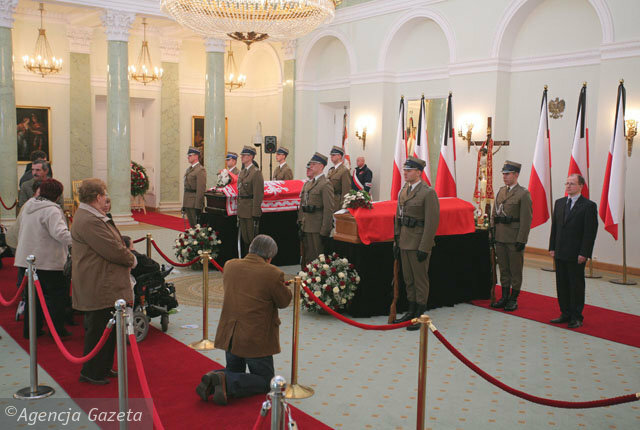 Lech and Maria Kaczyński’s coffins were greeted by a 21-gun salute and then interred in one of the underground crypts in a private family ceremony. 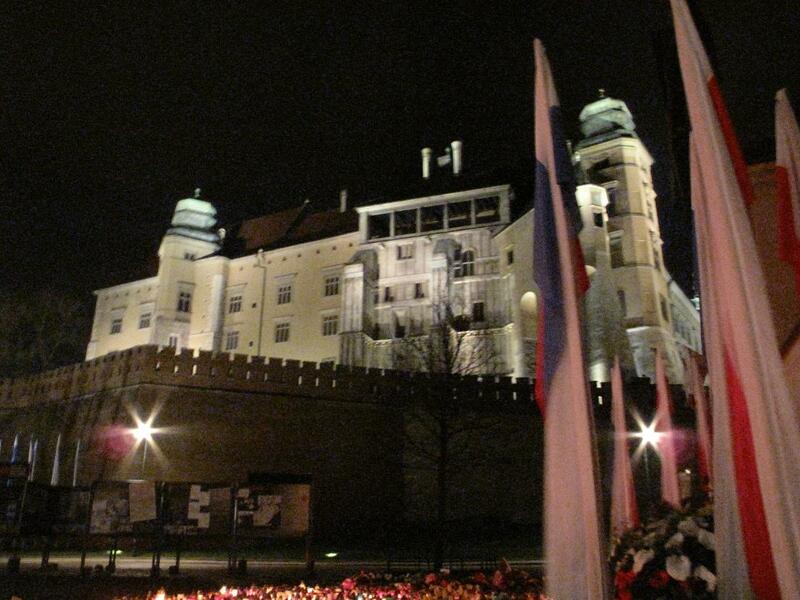 The crypt where Lech and Maria Kaczyński were laid to rest was opened to the public at 8pm that night. 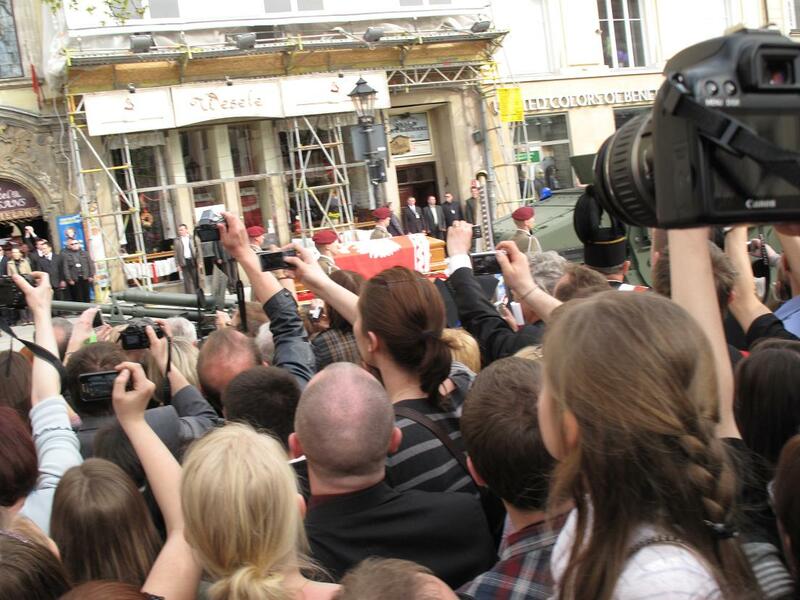 People waited for hours to get in and pay their last respects. 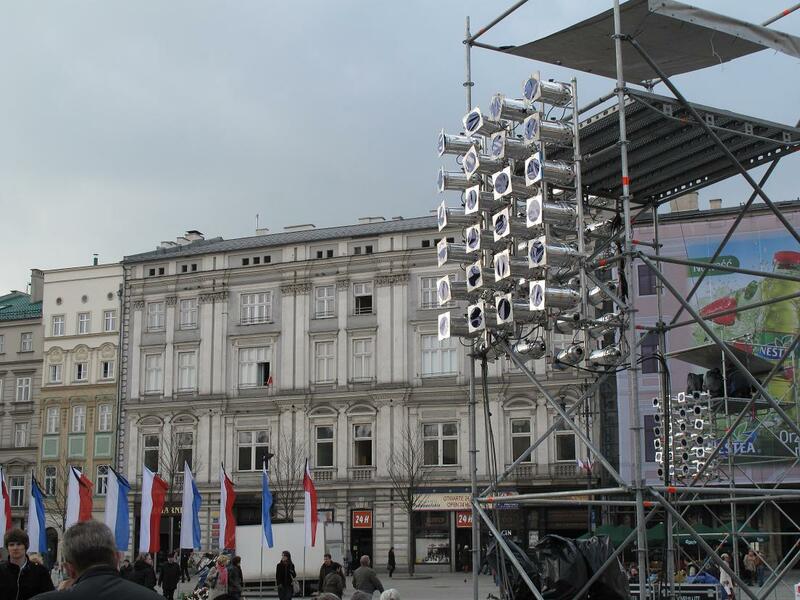 Whether or not Poles supported Kaczyński in the past, his funeral transcended politics and became a display of national solidarity. It showed the world a proud, stable nation rich in tradition and distinct in identity. Its dignity in the face such a tragedy can only be admired. 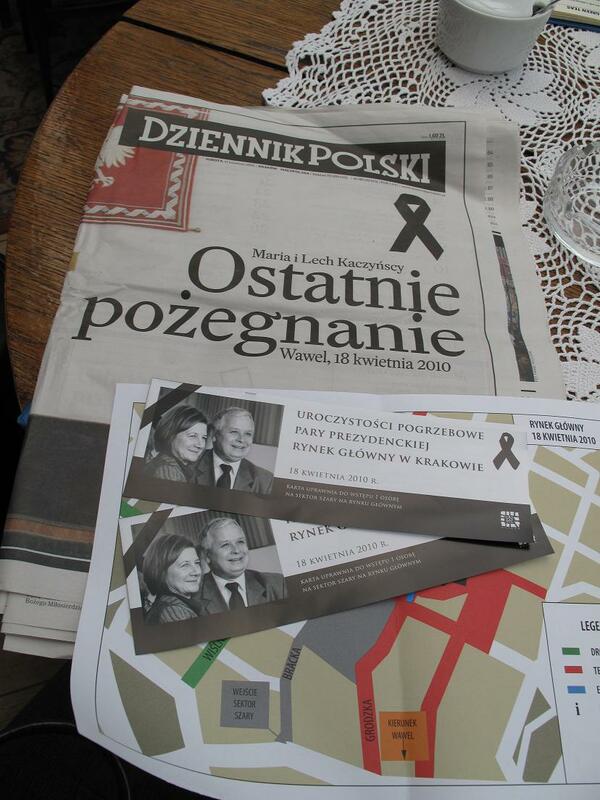 After being identified by her brother thanks to a wedding ring with an inscription, nail polish and distinguishing marks, the body of First Lady Maria Kaczyńska arrived in Warsaw today. 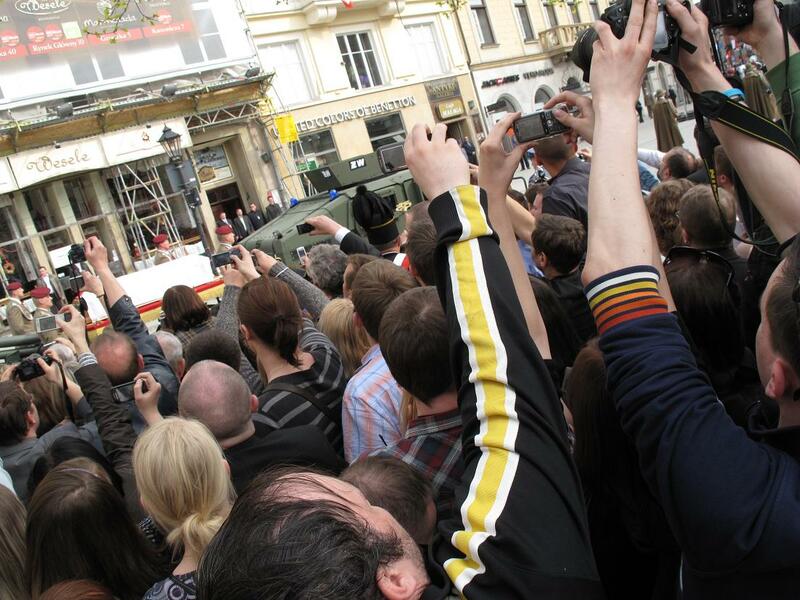 After a short ceremony at Warsaw’s Okęcie airport, her funeral procession followed the same path as it did just two days before, when her husband’s coffin flew in from Smoleńsk to a stunned nation. Despite it being a work day, thousands of people lined the streets, eager to welcome their First Lady back home. 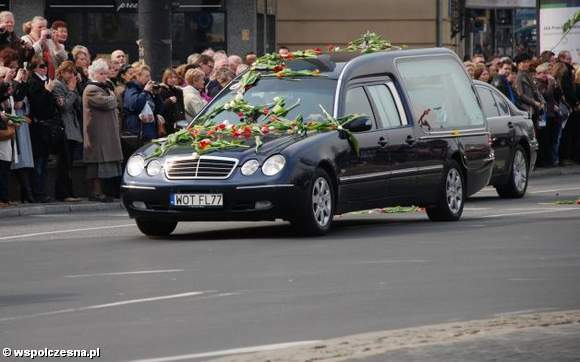 Tulips, daffodils, and roses showered the hearse as it made its way to the Presidential Palace. Her coffin will lie in state day and night, beside that of her husband’s, allowing citizens to pay their last respects before Sunday’s funeral. “Together they lived here, together they set off on their last journey, and together they died. 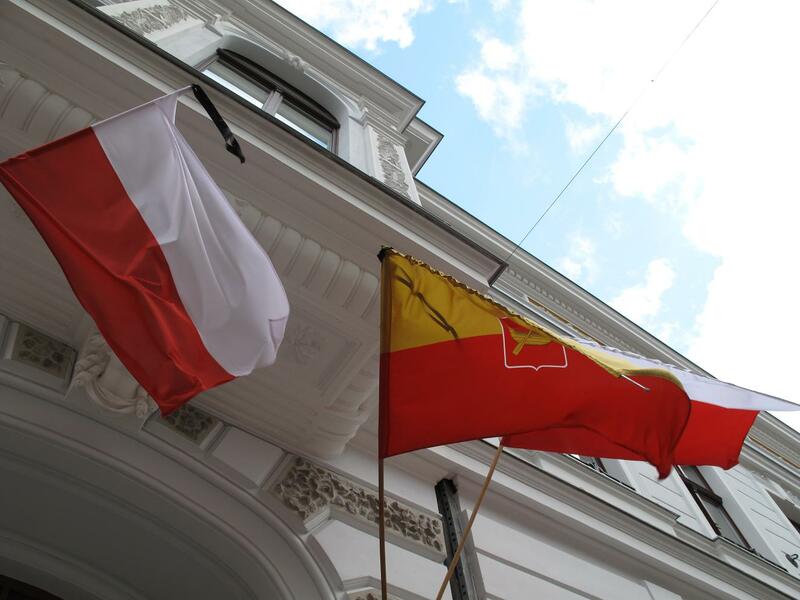 They should symbolically welcome people who come to pay tribute to them together as well,” said Jacek Stasin from the Presidential Chancellery. 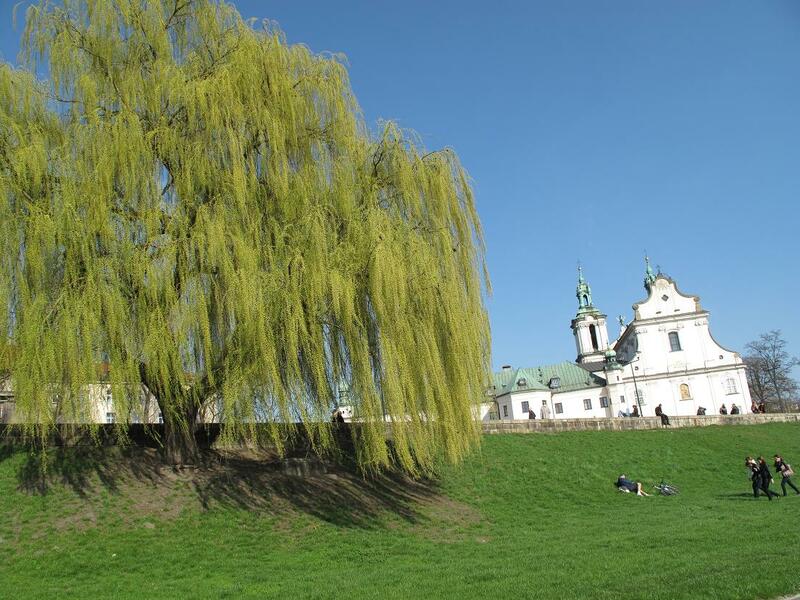 In a press conference today, Kraków’s Cardinal Archbishop Stanisław Dziwisz announced that the Kaczyńskis will be laid to rest at Wawel Castle in Kraków– the main burial site of Polish monarchs since the 14th century. 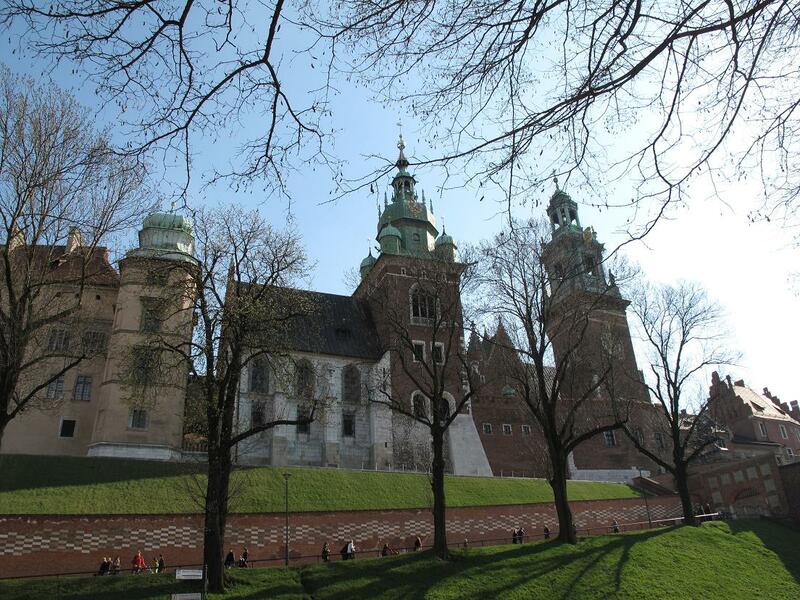 The state funeral will take place on Sunday, April 14, 2010 at Wawel’s 1,000-year-old cathedral. 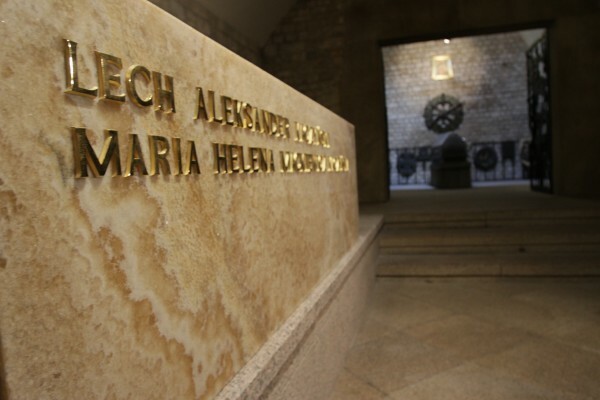 It is reported that the Kaczyńskis will share their crypt with Marshal Józef Piłsudski (1867-1935), considered by most Poles to be the greatest Polish statesman and who was largely responsible for Poland regaining its independence in 1918 after 123 years of partitions. I have been putting off this post for a while. 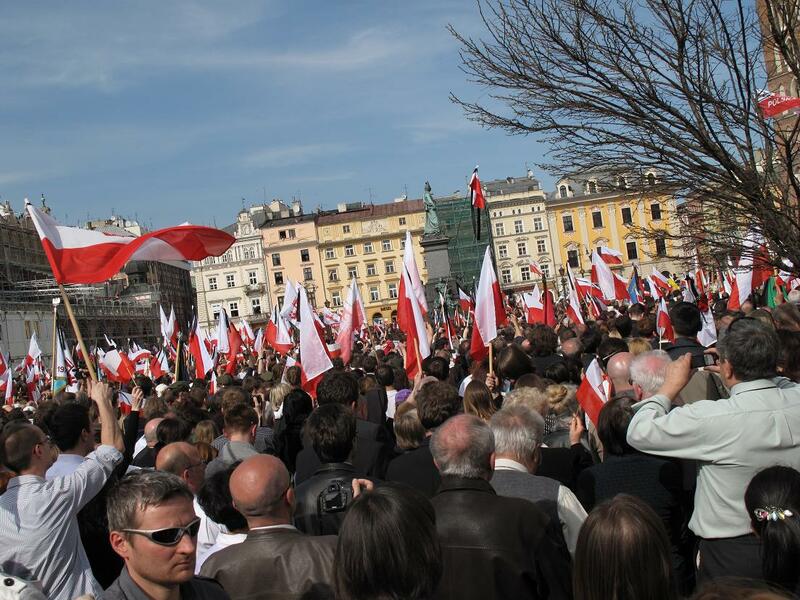 To be honest, the death of President Lech Kaczyński and his wife Maria, along with top officials of the Polish government came as a complete and utter shock to me and everyone in Poland. 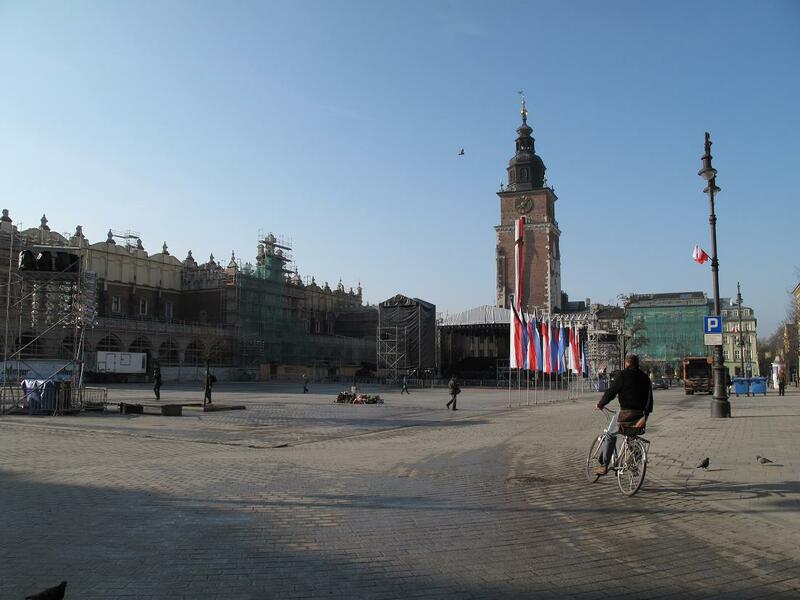 I found out from an elderly man on a bicycle, as I was waiting for a taxi outside of the Radegast Station Holocaust Museum in Łódź with two other Fulbrighters this morning. 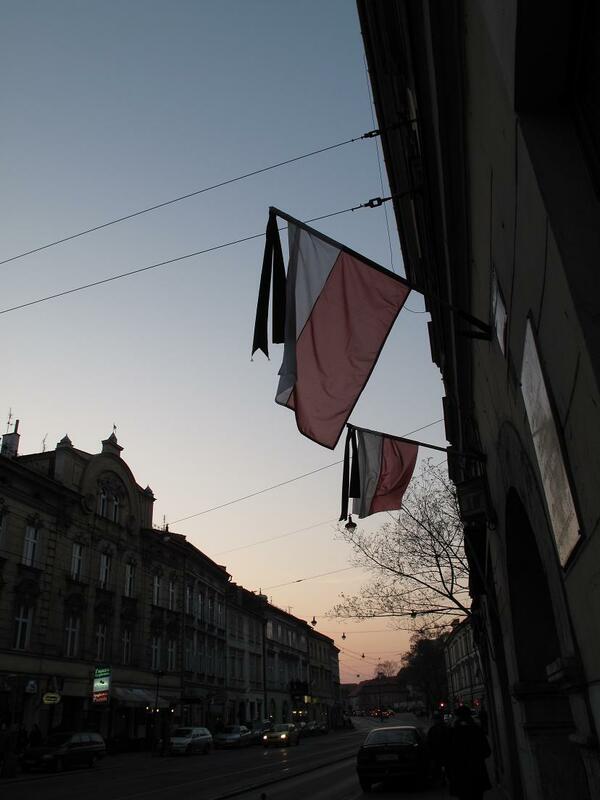 Immediately, Polish flags sprang up everywhere, draped with black ribbons. 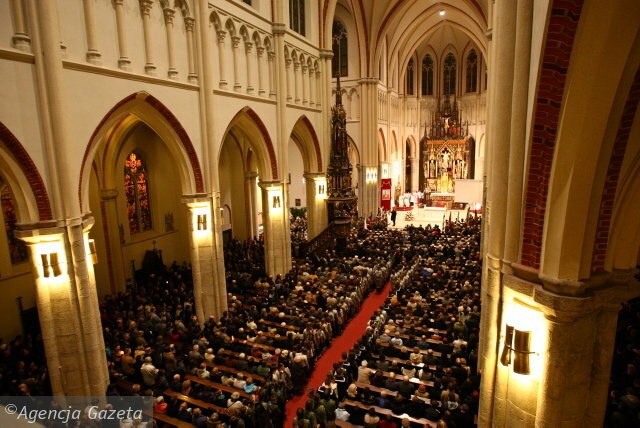 I attended a mass in the intention of the victims of the plane crash at the St. Stanislaus Kostka Cathedral in Łódź. 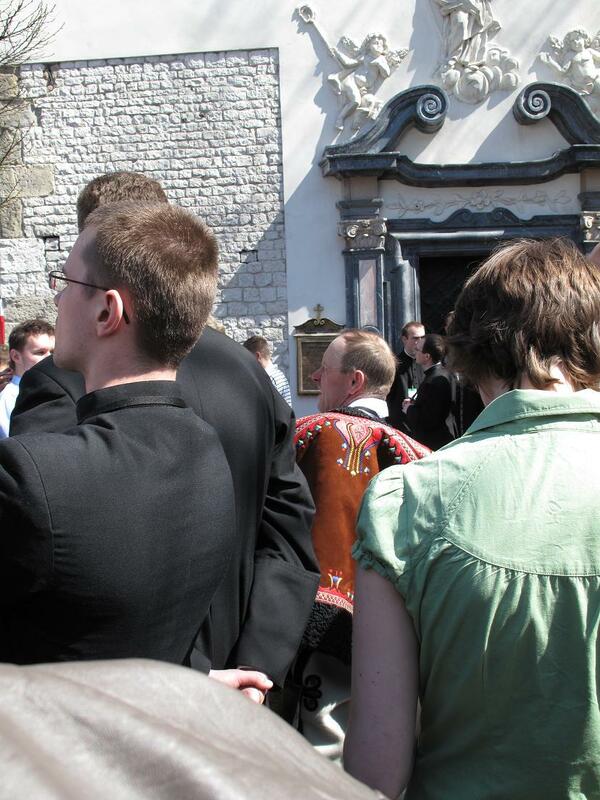 The archbishop of Łódź, Władysław Ziółek, celebrated the mass and was joined by the President of the City of Łódź and other top officials. It didn’t matter if you were the President of Łódź or an art student–you could stand side by side at the Tomb of the Unknown Soldier and commemorate this tragic loss. The last time I remember being in a church so packed was at the mass for Pope John Paul II at St. Patrick’s Cathedral in NYC. My mother and I just made it into the cathedral before they reached capacity and shut the doors. Then and now, it was amazing to witness everyone joining together in mourning. 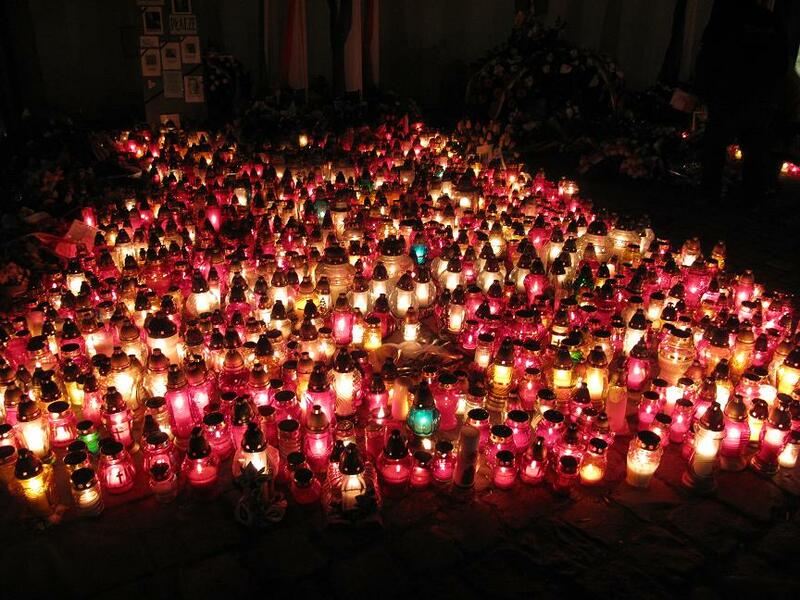 The statue of Pope John Paul II outside the cathedral in Łódź was enveloped by candles and flowers. 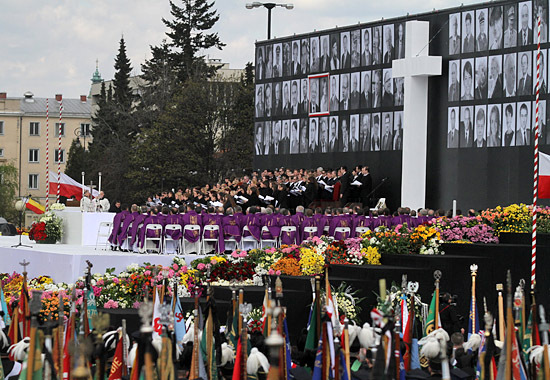 Since the 5th anniversary of the death of Pope John Paul II happened to fall on Good Friday this year, today (April 10, 2010–the eve of Divine Mercy Sunday) was designated for masses in his intention. It is an unsettling coincidence. The President’s plane went down at 8:56am Warsaw time in Smolensk, Russia after repeated attempts at landing in dense fog. Apparently on its fourth attempt, it clipped trees and caught fire upon crashing to the ground. 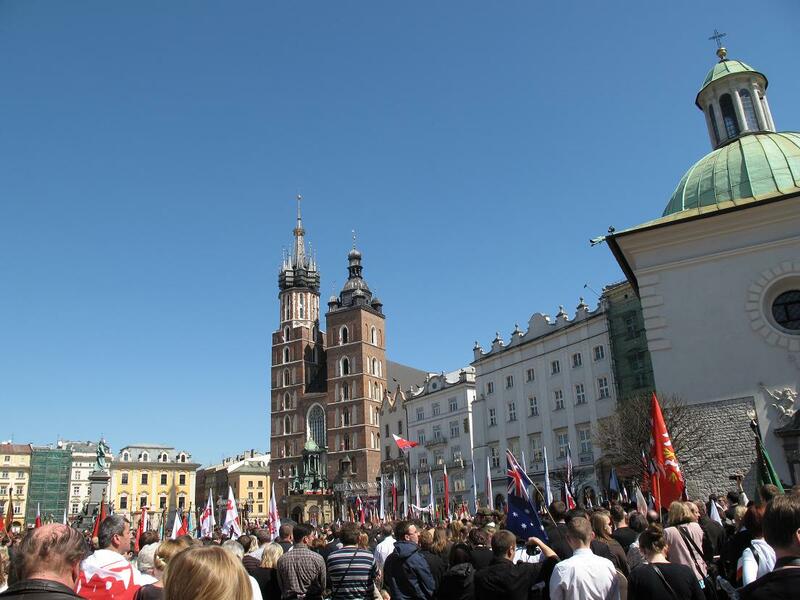 President Lech Kaczyński and all those on board were headed for Katyń memorial ceremonies, which have been taking place all week. 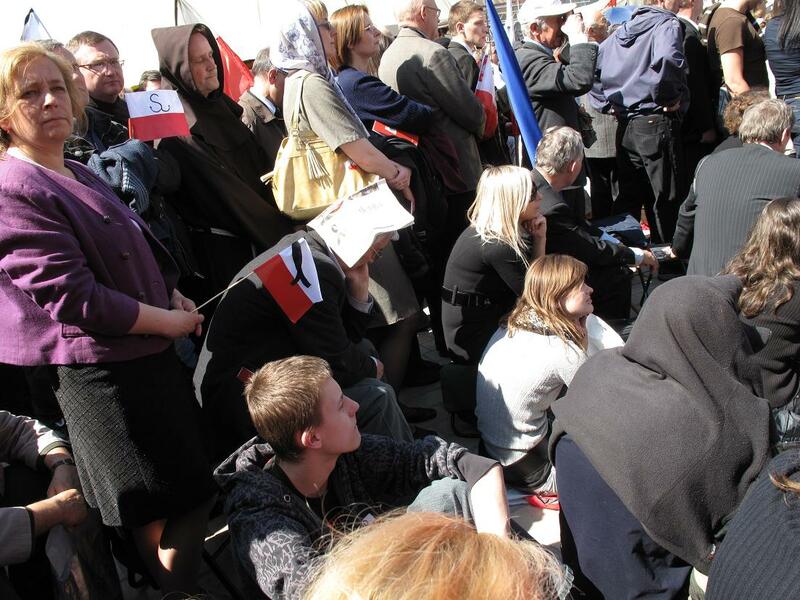 It is the first time Poland and Russia have jointly commemorated the Katyń massacre of 1940, when 22,000 members of Poland’s intelligentsia were brutally murdered and buried in mass graves in the forests of Katyń, in western Russia (what is now Belarus). The Katyń massacre refers to the murder of Polish officers in the Katyń forest, who were from the Kozielsk prisoner of war camp. Officers from the Starobelsk and Ostashkov camps, as well as in West Belarus and West Ukraine, the NKVD headquarters in Smoleńsk, and various prisons across the Soviet Union were also murdered. There is a Belorusian Katyń List that has yet to be revealed with names of Polish prisoners of war to be murdered at various locations in Belarus and Western Ukraine. 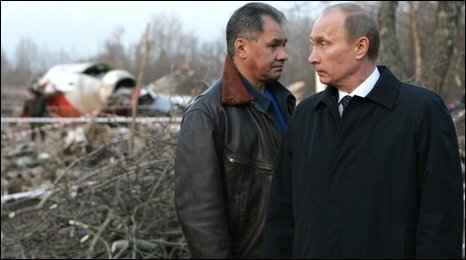 Vladimir Putin was to have presented Prime Minister Donald Tusk with the list on Wednesday; it did not happen. Those who died at Katyń included an admiral; two generals; 24 colonels; 79 lieutenant colonels; 258 majors; 654 captains; 17 naval captains; 3,420 NCOs; seven chaplains; three landowners; a prince; 43 officials; 85 privates; 131 refugees; 20 university professors; 300 physicians; several hundred lawyers, engineers, and teachers; more than 100 writers and journalists; as well as about 200 pilots. In all, the NKVD executed almost half the Polish officer corps. Altogether, the NKVD murdered 14 Polish generals during the Katyń massacres. The mass graves of those murdered were discovered by the Nazis in 1943, but the Soviet Union shifted the blame onto Nazi Germany. So. just imagine it’s 1940 for a moment. Your brother, husband, or father– most likely a military officer, professor, lawyer, physician– disappears. The last thing you hear is that he boarded a train to be sent off to a forced labor camp somewhere in Russia. Three years go by and Nazi Germany announces its discovery of mass graves of Polish officers. There are bullet holes in the back of all the skulls. The Nazis put up lists of the names of all those who were murdered. The Soviet Union denies responsibility. The war ends in 1945, the Red Army invades Poland and sets up a Communist regime. 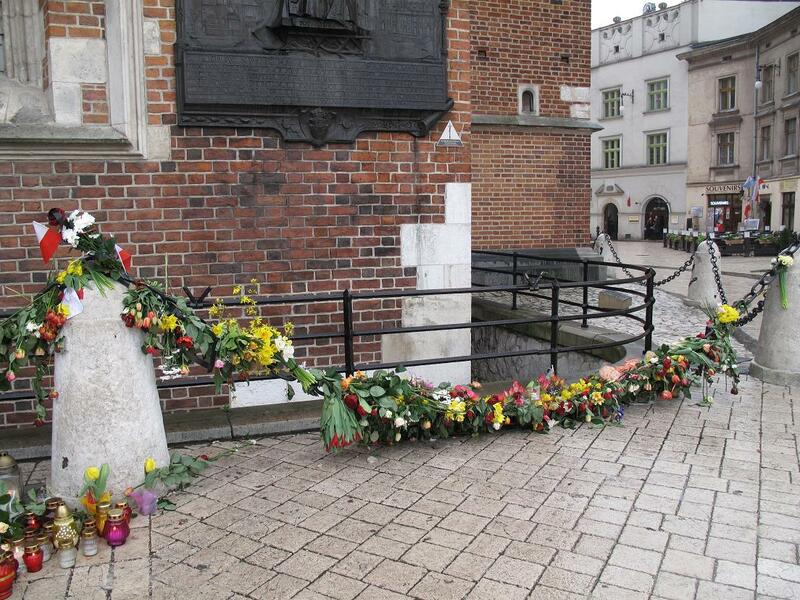 It continues to deny the Katyń massacre and gets rid of anyone who is inconvenient– anyone who is making too much noise. The Soviet Union continues to deny responsibility until 1990, when NKVD documents are finally revealed proving the Soviet Union not only perpetrated the murders, but elaborately covered them up. Imagine not being able to openly talk about the loss of your loved one for 50 years. 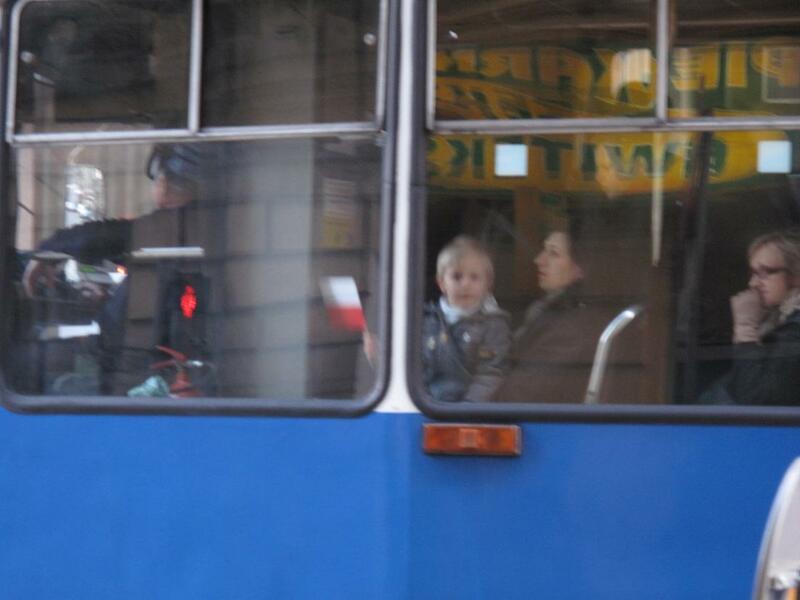 I think the most tragic twist of fate in this whole thing is that dozens of these people– the family members of Katyń victims–were aboard the President’s plane. They were on their way to pay respect to their loved ones. Instead, they joined them in the forests of Katyń. 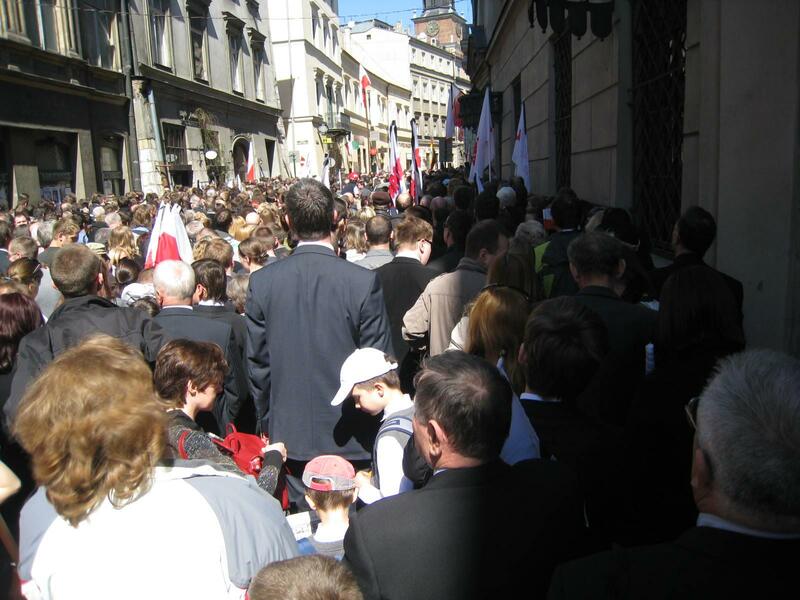 Furthermore, the highest officials of the Polish government, leading historians, and religious officials were on their way to honor the memory of their murdered countrymen, who were once, too, members of the Polish elite. The whole world has finally learned about Katyń. It’s just such a shame that another tragedy was what finally brought it to light. 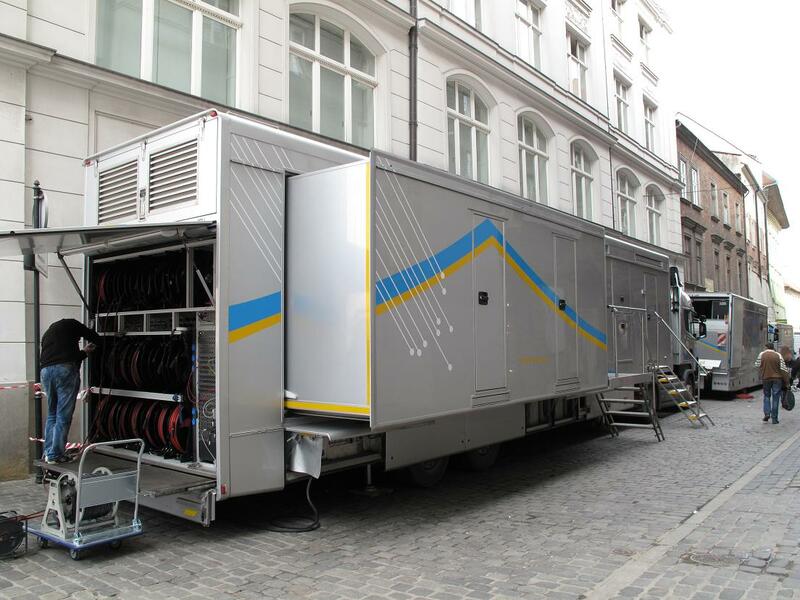 Wieczne odpoczywanie racz im dać Panie, a światłość wiekuista niechaj im świeci. 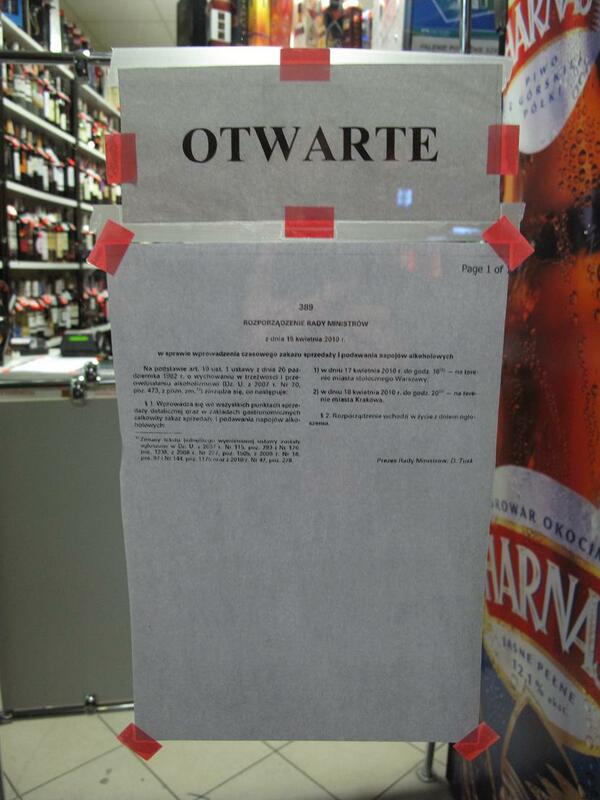 Niech odpoczywają w pokoju wiecznym. Amen. Please go rent Andrzej Wajda’s film Katyń. 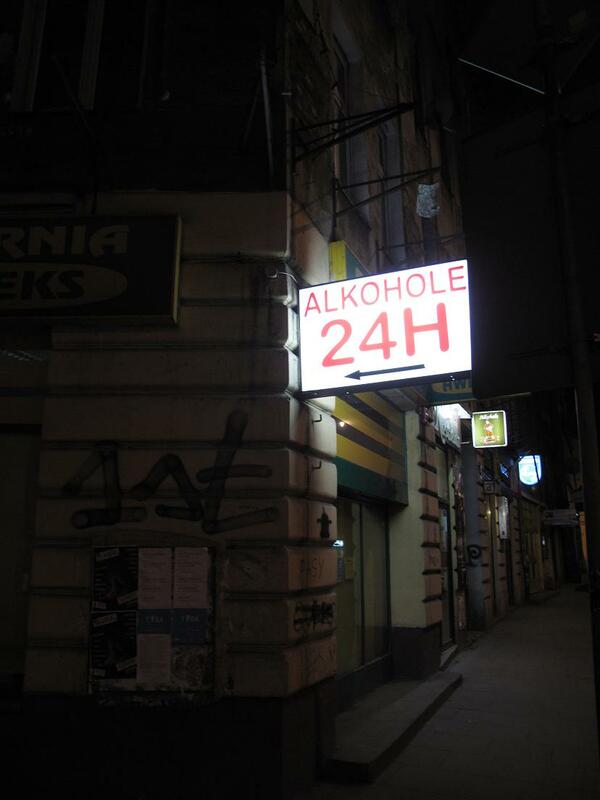 Świat się wkońcu dowiedział o Katyniu. 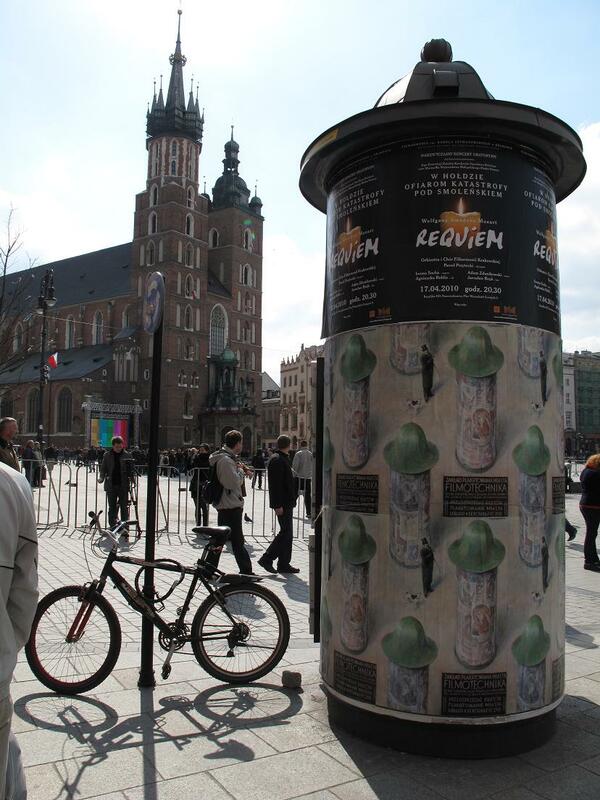 The world has finally learned about Katyń.